Well hello, lads and lasses. This week, Beliribbun, Iowa, is setting aside its rich, Cajun roots for one night only as it embraces the culture and traditions of the Emerald Isle for Saint Patrick’s Day. 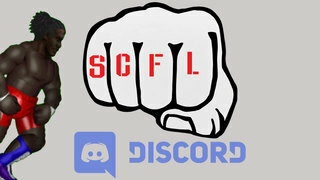 Superchat Pro Wrestling comes to us live, on Saturday, March 17th at 11:30PM MT, exclusively on twitch.tv/scflpro with a night of shamrocks, shillelaghs, and shenanigans. Last week saw the crowning of the inaugural US champion, as Spencer Morgan outworked the competition to win a four-man tournament. Unfortunately, what was described by SCFL leader Bichael Bianchi as an upper echelon title, second only to the World Heavyweight championship, was in actuality proven to be a simple coffee mug, emblazoned with Sledding Bianchi’s face and the words “Uncle Sledding”. As it turned out, Bike had entrusted his cousin, Xylophonist Bianchi with the task of creating the title, and poor, sweet Xylophonist, hearing only the words “US Title” set about finding something to honor his dear Uncle Sledding. The main event of what was supposed to be a Sons of Anger celebration in honor of 311 Day was also met with disappointment as the newly crowned Trios champs, Ratt Middle, Gorvis Rogers, and Rastaban Baptiste were scheduled to take on The Fixers, Xylophonist, Let Liu, and the newest member, Ratt’s little brother, Dougie Middle. However, Sledding Bianchi somehow involved himself in the contest, coming to the aid of his beloved nephew, and though the Sons of Anger are generally a dangerous group, and The Fixers, by and large, aren’t, the addition of a fourth man swung the balance in favor of the perpetual underdogs, as Sledding forced Ratt Middle to tap out. It’s still unclear if the match was initially scheduled to be a Trios title defense and if it remained one after Sledding joined the fray. All that we know is last night, things were less Unity and more From Chaos. As last week’s show wrapped up, Bike Bianchi made it known that since the next event would take place, at least partly, during St. Patrick’s Day, resident Irishman, Kelly Kelley would be the beneficiary of several unique opportunities throughout the night. Kelley, who hasn’t been seen inside a SCFL ring in nearly a month, has been announced for the night’s Opening Scramble bout, but Bike insists that his involvement with the show doesn’t stop there. Sadly, it appears that Bike is keeping a lot of this card very close to the vest, as only a handful of matches have been announced. In addition to new Scramble champ Boxing Bianchi defending in the opening contest, there will be several tag team contests, starting with The DSA, America Wright and Aladdin Bell, taking on the LOST Boyz of Both Ferrari and Until Robert. These two teams have had moderate success in the past, and an impressive win here will certainly propel them up the tag rankings for possible title contention. Last week saw the debut of Giovanni Dinner, and though he didn’t win, he certainly made an impression, or at least his Mama did. She distracted head referee Sledding Bianchi multiple times, saving Giovanni from pinfalls, but in the end, it wasn’t enough and Dinner was dashed. This week, Giovanni will take on the heavy hitting DuBois. We can only hope that Mama Dinner will leave the action inside the ring to her son. Garden Greene, the man that defeated Dinner, will be taking on a man more familiar with lunch, Bradford Culpepper. Culpepper had a brief run exclusively giving Kelly Kelley brain damage, but it looks like the substitute cafeteria worker is moving on to dishing out punishment to the SCFL’s premier salad slurper. The only other contest currently on the cards is a Tag Title match, so until further notice, consider it the evening’s main event. The champs, Philly and Gyro Supreme look to defend not only the belts, but the honor of the Supreme Family against Weather Walker, and perhaps their most hated foe, Computer Collins. Walker is dangerous in his own right, having ended the kickboxing careers of several men, but Collins is public enemy number one for the Supremes. He was responsible for the death of Philly’s young, naive son, Stromboli Supreme after a brutal knockout in kickboxing. The animosity doesn’t end there, as two weeks ago, to earn this title shot, Collins severely injured Cheesesteak Supreme, Philly’s powerfully moronic brother. This card, while sparse on details, promises to provide a lot of action, and hopefully, Bike Bianchi will reveal a little more of what he has in store for Kelly Kelly and the rest of the roster. 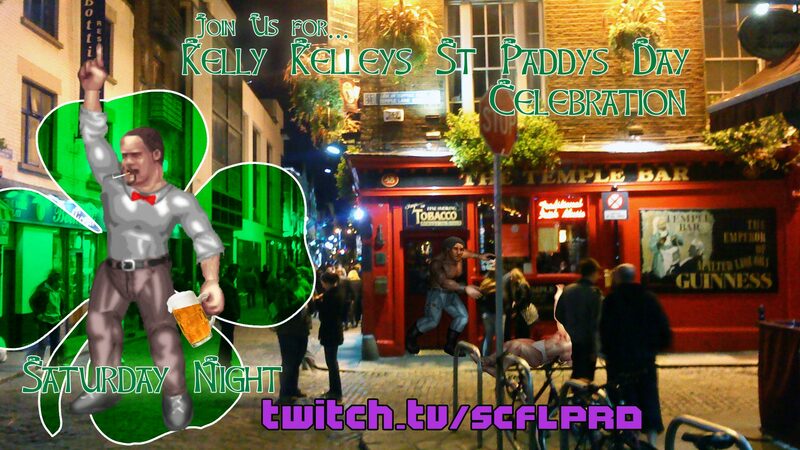 Please tune in to twitch.tv/scflpro this Saturday night for an Irish extravaganza.